I was raised in a Christian home, does this surprise anyone? I hope not. Both sets of my grandparents were pastors. From the time I was a little girl, I had people at different churches tell me how much I looked like my Grandma, Carmen Ingle. As a young girl, and as I got older, I took this as a big compliment. I always thought grandma was the prettiest older lady I knew, with her trim figure and salt and pepper hair. She told me her beauty secret was using Oil of Olay everyday morning and night. One of my very first memories of Grandma is when I was little and she flew down to our house in Southern California and picked me up and took me to her house in Santa Rosa. She let me sleep in the guest bedroom with the big bed. Every morning she would come and wake me up by saying, “Wake up, Snow White!” She also introduced me to her slides of the family! To this day, I love going through the slides and hearing the stories from long ago. Grandma loved to dance, sing, and listen to music. When she would hear music she would dance all over the room she was in. She would sing hymns, praise and worship songs throughout the day. She would ALWAYS talk about how awesome Jesus was. The biggest thing she instilled in me was to pray. Grandma prayed about everything. As I was looking for a verse that I felt described Grandma, I automatically went to Proverbs 31; and, while many of those verses do pertain to her, 1st Thessalonians 5:16-18 describe her to a T. Grandma rejoiced in all things. She would praise God no matter what. She found something to rejoice in the Lord about everyday, whether it was a sunrise, or someone who came to know Christ as their Savior, or a beautiful flower. She prayed unceasingly. Whenever a need would arise in anyone’s life, she would write it in her prayer journal and two or three times a day she would pray over everyone in her journal. When a prayer would be answered, she would write the date that it was answered next to the name. It was humbling to see my name on every page of the journal I have, along with the rest of the family. Sometimes prayers were for specific things, sometimes it was for blessings. Lastly, she was thankful for everything that came her way. Last year, we went through the storage shed and found letters that she had written to her Sister in the 50’s. She spoke of some unexplained car trouble in a town in Oregon, but thanked God for the car trouble, as the mechanic who helped him gave his heart to Jesus. She spoke of having little money in places, but gave thanks to God for providing what they needed and seeing souls saved for His kingdom. 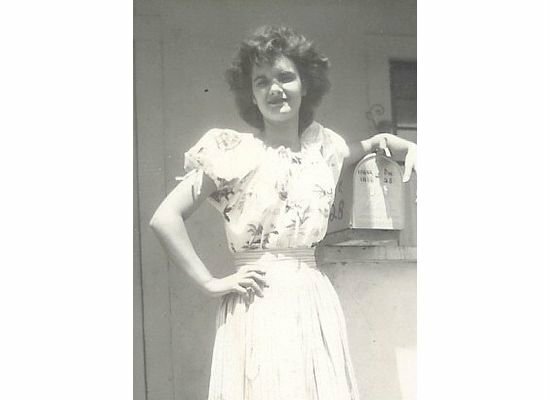 Grandma was a confidant and mentor of mine. She was the first person I told that Matt had asked me to marry him. She taught me that day how to flirt with him by winking at him with my mouth wide open. ;0. After 18 years of marriage, I still wink that way at Matt everyday and we giggle over her flirting ways. I gave birth to my first born child on her birthday, she says Sarah was the best birthday gift she has received. As grandma got older, dementia and Alzheimer’s set in. The last few years of her life, I could see my Grandma forgetting things and even forgetting I was her granddaughter. She would introduce me as her niece. I would let her think that, as she called my daughter Sherry. When Grandpa could no longer care for himself and entered a rest home, I was asked to take her to visit him everyday. 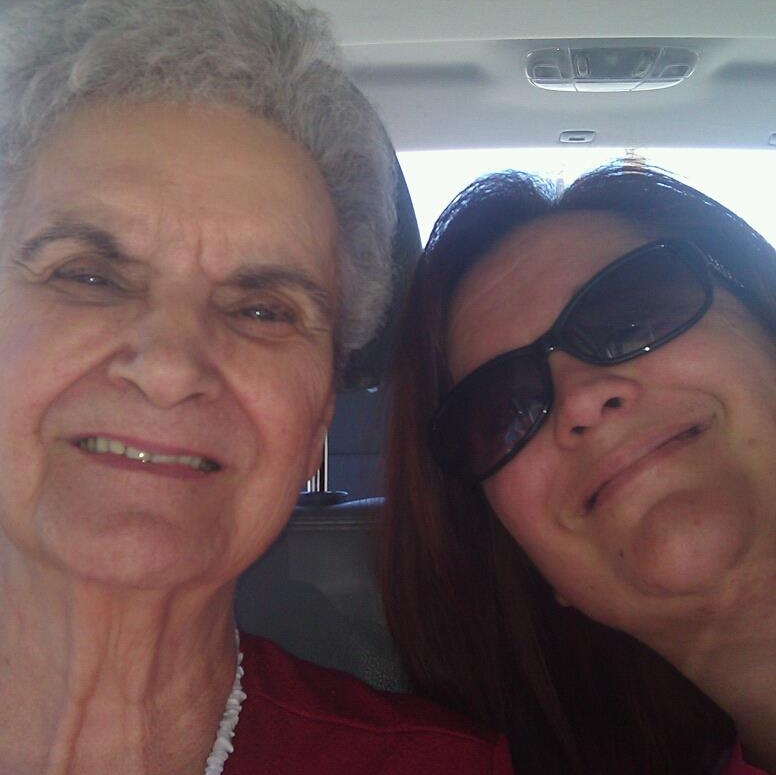 I loved the time I got to spend with her driving her around and at times even stopping to shop, or go to lunch. I, along with my parents, aunts, uncles, and a cousin watched her heart break as she said her final goodbye to her husband of almost 65 years last year. I sat with her in her room at the rest home afterwards, because she didn’t want to watch him slip from this life to glory. I comforted her every time she would wake up that day and ask if he was gone yet. I cried with her when she would forget at times that grandpa had passed and ask where he was. I rejoiced with her as we talked about how grandpa gained his reward for his faithful service to God. A few weeks ago, we knew time was getting close for Grandma to gain her heavenly reward. On July 8th, I watched my daughter hold her hand and thank her for teaching her how to draw and crochet, among other things. I saw the love in my grandma’s eyes, as she could no longer speak; but held on to every word my daughter was saying. As I sat and talked with her about the wonderful times we had together and watched her shake her head yes at remembrances I spoke about. Rubbing lotion into her worn hands that so willingly worked for the service of Christ, thanking her for being a Godly example to me. I decided at the last minute to go visit Grandma for my lunch break on Thursday, July 10th. I called my mom and took her lunch and spent time just quietly talking with Grandma. As my lunch hour ticked away too quickly, I went to her and held her hand. I leaned over, gave her a kiss and with tears in my eyes, and joy in my heart at her words, walked out of her room. One hour later, a co-worker came to find me and told me my dad was on his way to pick me up. I called dad and he told me Grandma had passed into glory. My heart broke, not for her, but for those of us left behind. The pain was great and overwhelming. If you do not know Jesus as your Savior and would like to, it is so easy. The prayer I prayed as a teenager was simple, “Dear Jesus, I believe that you came down to earth, died an unjust death, and rose again 3 days later for my salvation. I give you my life, and ask that you come into my heart that I may rejoice with you for eternity. In Jesus name, amen.” It is that simple. I would then ask you to start reading the Gospel of John (the fourth book of the New Testament) and learn more about Jesus. If you are already a Christian, I encourage you to Rejoice always, pray without ceasing, in everything give thanks; for this is the will of God in Christ Jesus for you. Also, say a prayer for my family and I today. God bless you.